These days I spend my time sniffing and chewing juicy bones in doggy Heaven, though previously I lived a pawsome life as Zigrid’s companion. It's Not About The Dog! I left my birth pack to move into my forever home with Zigrid as a cute (if I do say so myself) pup of 8 weeks. Life was truly pawsome! But before long Zigrid came to find me becoming a testy and challenging puppy. The reality was that I was just a dog who knew what I really wanted & my human family had not yet learned how to communicate with me. So off we went to a traditional K9 training school that used check chains (well to me it was a choker chain!) & this was when the ‘hound hit the ceiling’! I became even more unwilling and uncooperative with this style of training, but what did she expect? I was being told to do things I knew not how to do & would then receive a correction for not obliging! The more corrections Zigrid gave me, the unhappier I became until finally, because she simply was not listening, I resorted to aggression. Well that got her attention & then she heard me loud and clear! You see what Zigrid didn’t know when I first came into her life was that we K9s have a language of our own. Yes that’s right, just like people from different countries speak different languages, so too do we speak a unique language to humans. We communicate through body language as well as with our voices and we are always giving signals about how we are feeling. The problem for us is that often our humans are not aware of (or don’t understand) our K9 language, & they expect us to understand theirs. By the time I was 2 years of age I had had many a yanking on the good old choker chain, I had been tethered down for 20 minutes with a tent peg in a hole that I had previously dug, and yes can you believe it, I had a static collar used on me. The collar was used to stop me from taking things I shouldn’t. If only Zigrid had known then that a simple "leave it" request would have been much easier and kinder! (By the way Zigrid never actually pressed the button herself because she could not bare to do it). The incident that changed everything! I was enjoying a bone, which I really wanted and was not prepared to give up. Zigrid was told by her traditional dog trainer at the time to put a choker collar on and keep correcting me until I gave it up. Well, she did this, but the only result was me hanging by the check chain with my back legs off the ground! The trainer had told Zigrid that this technique would make me give up the bone. Well it didn’t because I really wanted the bone and I didn’t understand what the check chain was meant to be telling me! Thank heavens Zigrid only persisted with this for a few seconds, otherwise I may not have been around to help build Ziggy’s TLC. After that day, she tossed out the choker chain & cried for three whole days in despair and guilt. We left that training school & Zigrid (bless her heart) began to research other methods of dog training. She then threw herself into deep study & met her teacher and mentor (and my saviour) Gaille Perry, an animal behaviourist. The journey to a happy and healthier Zigrid and Jack had begun! Zigrid and I started off on a clean slate and before long she was speaking my language and our bonding blossomed. I learnt to trust her and the communication between us became crystal clear. We became inseparable. 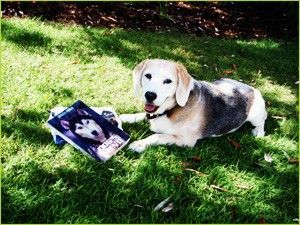 She felt truly inspired & began to teach other people how to achieve a happy and healthy relationship between dogs and humans and so the amazing Ziggy’s TLC was born. Yep, you guessed it; I became 2IC, assisting her & nurturing Ziggy’s TLC business, working by her side every day coaching humans and their furry K9s. I came to doggy Heaven at the ripe old age of 13, having lived full and happy life-serving humans to understand & communicate with their K9 buddies. I left behind my pack mates Dakota and Darcy who together with Zigrid continued to represent the loving passion, integrity and understanding that is Ziggy’s TLC. Our experiences together & Zigrid’s love for me was remarkable, a journey that has transformed into something that will continue to make this world a better & more beautiful place in which to live.